This trainer emits the real-life recorded voice, lung, and heart sounds of a 4-year-old. 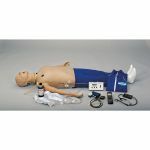 The trainer operates from a wireless remote that has a simple turn-and-select method of choosing the sounds you wish to emulate and at what rate. 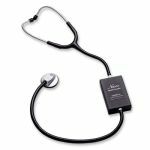 The sounds are delivered to 10 lung and one heart speaker locations that can be auscultated with any stethoscope. This limits the special equipment that your students need and reduces costs. 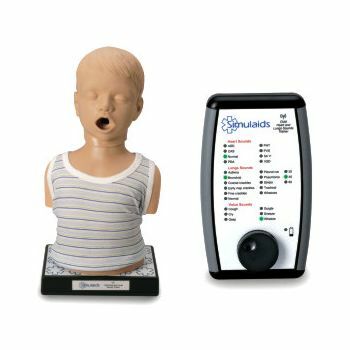 The trainer also has available a speaker jack through which you may broadcast the sounds being generated, so that the entire class can hear the same sounds. This makes it possible to utilize the trainer as a testing device for the entire class at once. No programming installation is required. Contents: The unit comes with a power cord, user reference, and carry case. 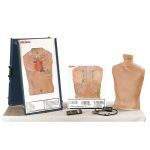 No assembly of manikin or installation of programming is required. Size: 19" x 18" x 9".